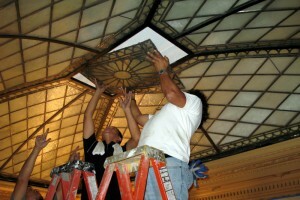 The New York Society Library engaged the services of Rohlf’s Stained and Leaded Glass Studio to restore a heavily damaged 94 year old stained glass skylight and replace the damaged & missing stained glass panes. 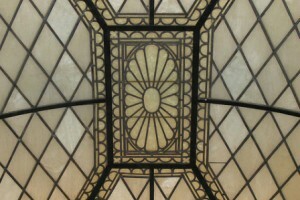 Interestingly, this spectacular stained glass skylight had been covered for decades & long forgotton about. Originally built as the John Rogers House, the building was converted to use as a library in 1937. 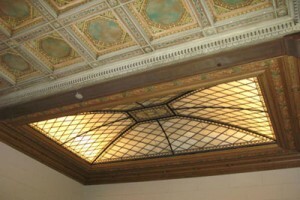 One of the buildings original & most spectacular features was a leaded glass skylight. 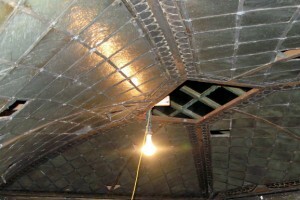 However, this beautiful skylight had been damaged & was leaking by the 1940’s. 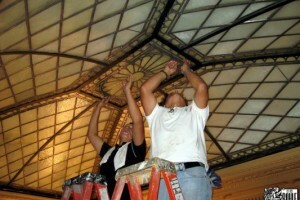 so rather than engage in costly repair work that the Library could not afford at the time, the decision was made to cover and protect the skylight until some later date. 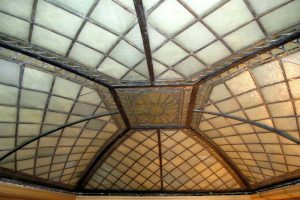 Being covered by a dropped ceiling, the stained glass skylight had been forgotten until a March 2010 New York Times column (Streetscapes: Where Fusty is Fabulous) by a former Library Trustee brought renewed attention to this hidden treasure. 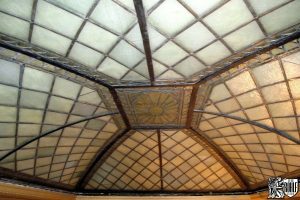 The Library, which was expanding at the time, decided to take this opportunity to restore their stained & leaded glass skylight to as close to its original state as possible. 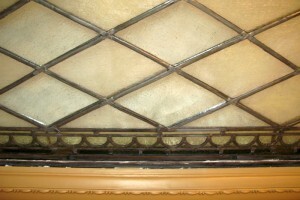 When uncovered after over 60 years, Rohlf’s Stained & Leaded Glass discovered the skylight was heavily damaged, with roughly 40% of the stained glass window panes missing or cracked. The skylight was carefully removed & taken to our studio in Mount Vernon NY to begin the stained glass restoration project. 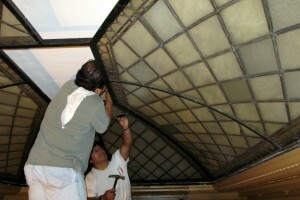 Finding replacement glass proved to be an impossible task due to the age of the skylight. Rohlf’s Stained & Leaded Glass was able to find glass of the same color and we were able to find glass that had the same seeding (an interior pattern of bubbles and streaks), but finding glass that had both qualities was not possible. Ultimately, Rohlf’s Stained & Leaded Glass Studio was able to recreate the appearance of the original stained glass by using an age-old technique known as “plating”. Stained Glass Plating involves using two plates of glass that are leaded together, one behind the other, to combine their qualities. When the glass was returned, Library officials found it nearly impossible to tell what was new and what was original.